So when I last posted, I was telling you about getting the cows up for the fall move, and we had left them in the corral for the night. Early the next morning, we were back. The first task was to get them into the sorting pens. Harland took care of driving most of them in himself, and then Gerald, Harland’s brother, and I got in the rest of the stragglers. The next task was to load them on the waiting tractor trailers. 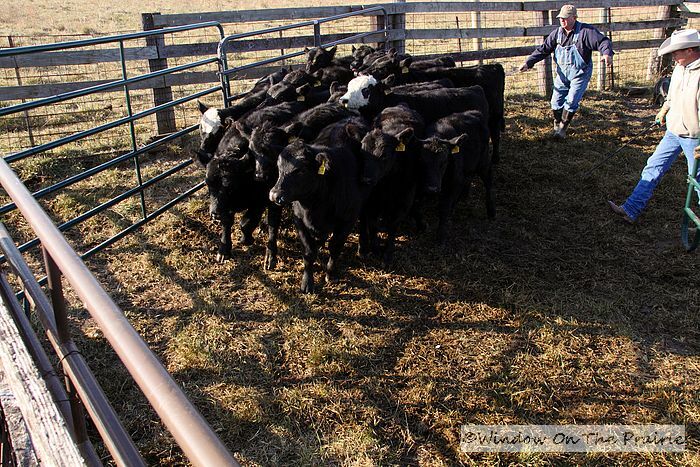 But first, we had to sort the cows from their calves. 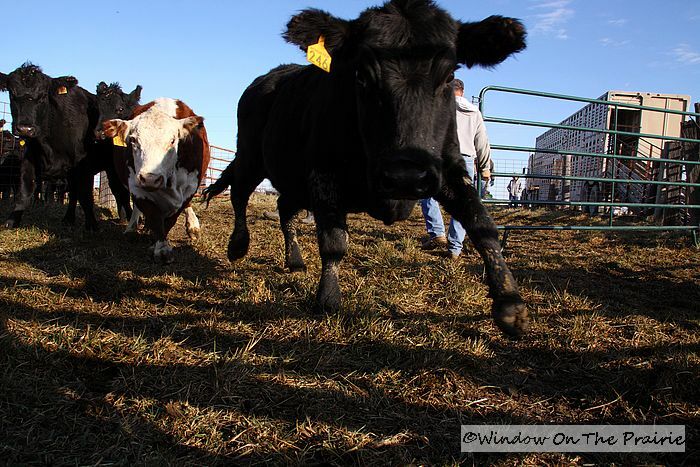 Riding in a truck can be dangerous for a calves if they are in with the much larger cows. 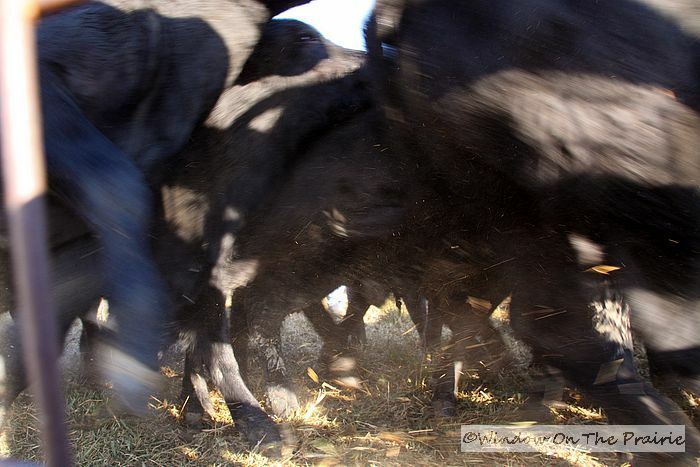 The calves could get trampled. So Harland and Gerald sorted the cows into an adjoining pen from the calves. 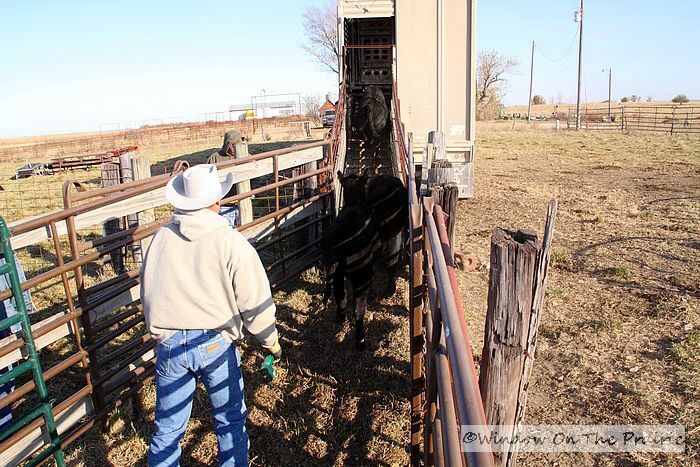 Then it was time to start loading the cows onto the first truck. 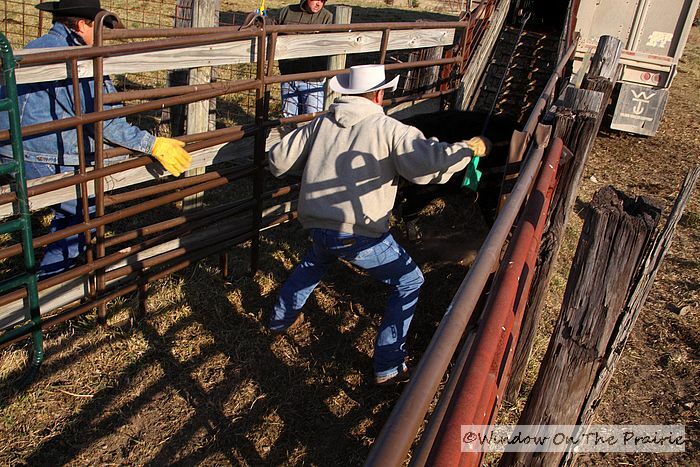 Harland and Gerald drove between 6 and 8 cows up the ramp into the truck at a time. The driver put each group into a different compartment within the truck. This ensured that the load was evenly distributed weight-wise. Once the cows were loaded, then it was the calves turn. They too were loaded in small groups at a time. 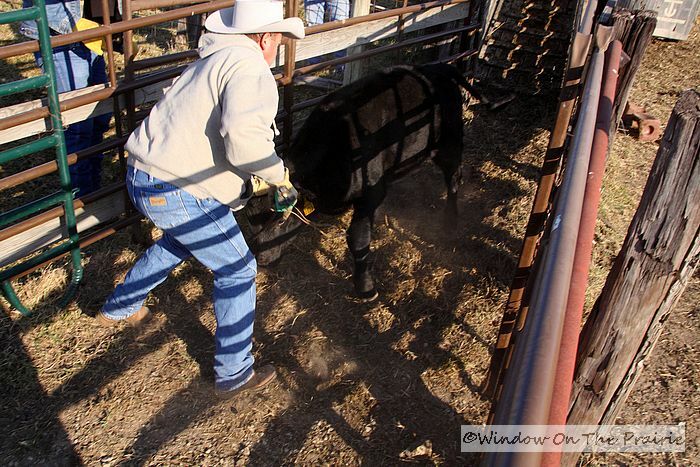 One of the calves got as far as the ramp to the truck and decided it didn’t want to go for a ride. So he tried to take out the truck driver. He also tried to jump over or run through the cattle panels. It was a real rodeo for a minute, but he was driven into the truck . Finally, everyone was on the truck and it was time to move out. The trucks headed on down the road. 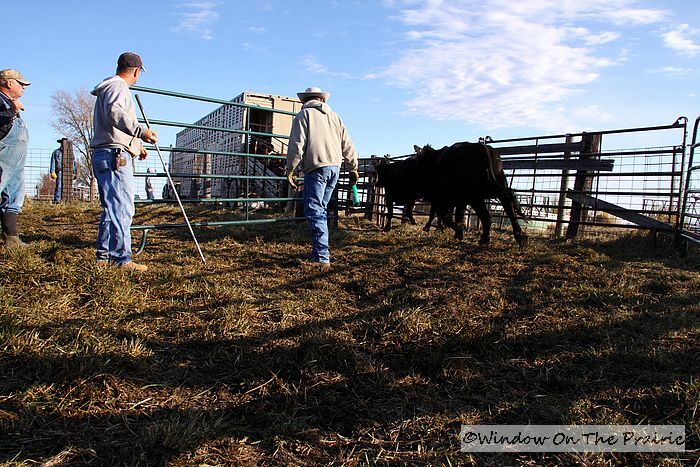 Ordinarily, we would follow along after we had taken down the cattle panels and loaded them onto our stock trailer, but the night before when we had called the cattle in, one of the cows and her calf did not come in. 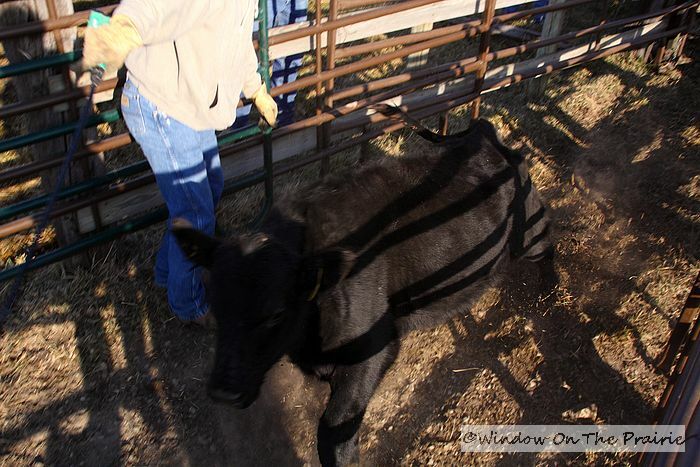 So after the trucks left the next morning, we spent about an hour trying to get her into the corral. Harland tried grain and hay, he tried driving her with the truck. Nothing worked. So we left her behind with her calf. We plan on going back for her later when she calms down. Here’s a short video of the highlights of loading the cattle onto the truck, from when the truck arrives to when it leaves. Yes, that’s the cow and calf who refused to come into the corral with everybody else. I’ll bet they felt silly watching as their herd left them behind. 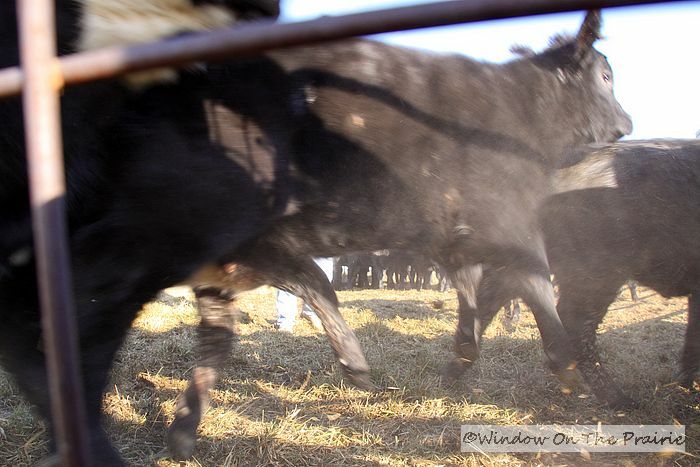 Since the herd came home, the calves have been weaned and the cows turned out into the harvested cornfield to eat what the combine left behind. We’ll keep the calves until January when they will go to the sale. 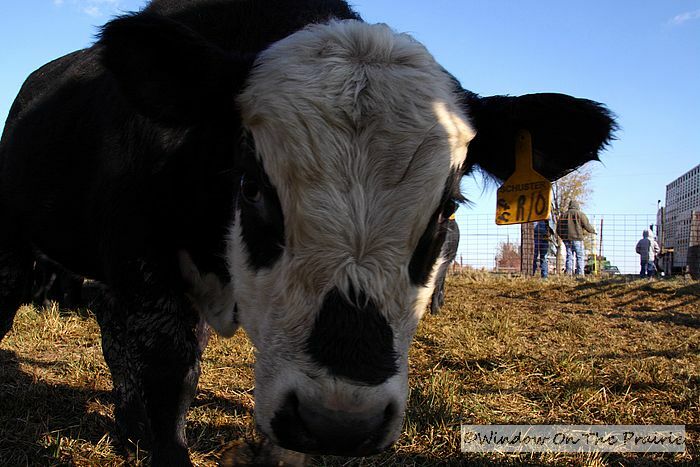 The cows will remain at our place and will have new calves in March and April. 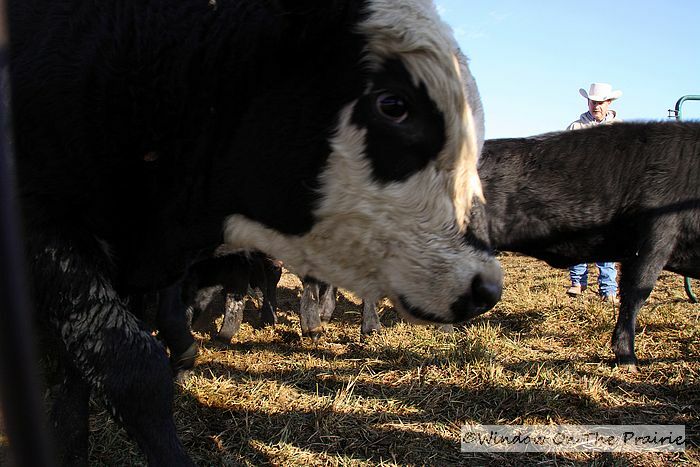 Then in May, the whole herd will be loaded onto the trucks again and taken back down to the summer pasture. And so the year goes with our cattle. Update: Our neighbor down at the pasture got the cow and calf corralled and we picked them up this afternoon. It took 5 of us to get her into our stock trailer. Our neighbor said at one point they had her penned but before they could get her into a trailer, she cleared the corral fence like a horse following the hounds. She’s finally back home now, but not for long. We’ll keep her calf, but she’s going to the sale this week. We don’t have the time or tolerance for a difficult bad tempered fence jumper.